A United Launch Alliance Atlas V rocket launches Orbital ATK’s Cygnus cargo spacecraft toward the International Space Station on March 22, 2016. The Atlas V is a type of rocket that is commonly used for interplanetary missions, military payloads and cargo runs to the International Space Station. This rocket type has had more than 75 launches (as of March 2018) with no complete failures, making it among the most reliable in the world. The rocket used to be operated by Lockheed Martin, but it is now operated by United Launch Alliance (a Boeing-Lockheed joint venture). Some of the notable missions it has launched include the Pluto-bound New Horizons mission, the top-secret X-37B space plane and the Mars Curiosity rover. An Atlas V rocket will also be used to launch the Boeing CST-100 spacecraft, which will ferry astronauts to the International Space Station in the next few years. Stages: 2. The first stage uses a Russian-built RD-180 engine, which is fueled by kerosene and liquid oxygen. The second stage uses an American RL10 engine manufactured by Aerojet Rocketdyne and fueled by liquid hydrogen and liquid oxygen. Solid rocket boosters: Up to three (as required per mission payload) Aerojet Rocketdyne SRBs on the Atlas V 400 series, and up to five on the 500 series. Launch pads: Space Launch Complex 41, at Cape Canaveral Air Force Station in Florida, and Space Launch Complex 3-E, at Vandenberg Air Force Base in California. Lockheed Martin Commercial Services originally developed the Atlas V for the U.S. Air Force Evolved Expendable Launch Vehicle program. The first launch of an Atlas V took place on Aug. 21, 2002. It successfully lofted the Eutelsat Hot Bird 6 broadcast satellite into orbit. On Aug. 12, 2005, an Atlas V performed its first launch for NASA — an interplanetary mission. The rocket hefted the Mars Reconnaissance Orbiter for an eventual rendezvous with the Red Planet. The spacecraft is still in operation around Mars as of April 2018. Some of its notable finds include imaging possible water streaks (called recurring slope lineae) in craters, tracking Martian weather and surface change and finding past and present landers. The Curiosity rover lifted off for Mars on an Atlas V on Nov. 26, 2011. Curiosity has found extensive evidence of past liquid on the Red Planet's surface. The Juno spacecraft started its journey to Jupiter on Aug. 5, 2011. The spacecraft is still in orbit around Jupiter and beaming back information about the gas giant's weather and interior. NASA's Mars Atmosphere and Volatile EvolutioN (MAVEN) mission left Earth on Nov. 18, 2013, aboard an Atlas V rocket. MAVEN is investigating atmosphere loss from Mars, which could explain why the Red Planet doesn't have the vast streams of running water today that are evident in the geological record. Other space missions include asteroid mission OSIRIS-REx (Origins, Spectral Interpretation, Resource Identification, Security, Regolith Explorer), the Lunar Reconnaissance Orbiter, the Solar Dynamics Observatory and the Van Allen Probes and the (future) Mars InSight lander. Atlas V rockets also have been used for International Space Station missions. The first one took place on Dec. 6, 2015, when an Atlas V lifted Orbital ATK's Cygnus spacecraft to orbit for a resupply mission. Even the mysterious Boeing X-37B spaceplane missions have been taken into orbit using the Atlas V. This reusable, uncrewed spacecraft is used by the United States Air Force, but its true mission is classified. Atlas V rockets are known for their incredible success rate, flying more than 75 launches between August 2002 and March 2018 with no complete failures. On at least two occasions, though, Atlas V rockets had partial failures that (luckily) did not affect the outcome of the mission. The first was on June 15, 2007, when the Atlas V put two reconnaissance satellites for the National Reconnaissance Office into a lower orbit than expected. More recently, the first stage shut down early during a Cygnus resupply mission that lifted off on March 23, 2016. Cygnus was still able to make it to the International Space Station, but Spaceflight 101.com said it was a very close call: "Had the RD-180 engine shut one second earlier than it did, Centaur [the upper stage] would not have been able to compensate and Cygnus would have ended up in a lower orbit. With shutdown another 1.3 seconds earlier, there would not have been a mission for Cygnus as perigee would have remained within the atmosphere, even when using all of Centaur’s performance." This United Launch Alliance graphic shows how the Sierra Nevada Corporation's Dream Chaser space plane will launch atop Atlas V rockets to deliver cargo to the International Space Station. Boeing's CST-100 is one of two spacecraft selected to ferry astronauts to the International Space Station. The company received a contract valued at $4.2 billion from NASA in 2014 for the first round of commercial crew flights; SpaceX's Dragon received $2.6 billion at the same time. CST-100 will use an Atlas V to send astronauts to the orbiting complex. A January 2018 update from NASA described the various tests that the CST-100 will undergo before carrying astronauts. This will culminate with an uncrewed orbital test flight that will take off from Cape Canaveral Air Force Station; at the time, NASA did not give a date for this flight, but media reports say this could take place in 2018 or 2019. After the test flight is complete, Boeing will send a crewed test flight with two astronauts on board. Other companies have also considered using Atlas V for their own human spaceflight programs. Sierra Nevada Corp. once submitted a proposal to NASA saying its Dream Chaser would use the Atlas V for ISS astronaut flights, but its proposal was not selected. 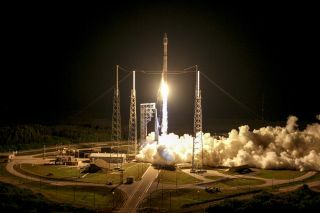 Bigelow Aerospace has also said it might use the Atlas V for flights to its own, future private space station.